A common question we get asked is how do solar panels reduce energy bills? Well, in this article, we’ll take a look at the different ways you can use solar energy to achieve this. Electricity prices aren’t getting any cheaper. High energy costs are a growing problem in many parts of the world. Solar energy can, however, offer those who can afford the upfront capital a return on their investment (ROI). This can be done through a reduction in their average electricity costs. Let’s take a look at how that can be done. You can install solar panels to generate a source of clean and renewable electricity for your home. Doing this allows you to tap into the free energy source that is the sun. If you would like to learn about how solar photovoltaic panels work, we have a diagram explaining this. After the cost of installing your solar panel system, you will be able to generate electricity from free solar energy. Whilst it is unlikely that you will be able to source all of your power requirements from solar alone, you can expect to significantly reduce the amount you have to pay your local utility company. According to this data from the U.S Energy Information Administration, the national average energy bill for a US household was $111.67 per month in 2017. This equates to around $1340 per year – and that’s just the average! In some states, the average monthly bill is around $140. Surprisingly, Hawaii has the most expensive average energy prices at $149 per month. As electricity rates continue to skyrocket, more and more homeowners are looking to make savings with solar power. Most people know they can use solar panels to generate electricity, but fewer people know they can also use them for heating water. 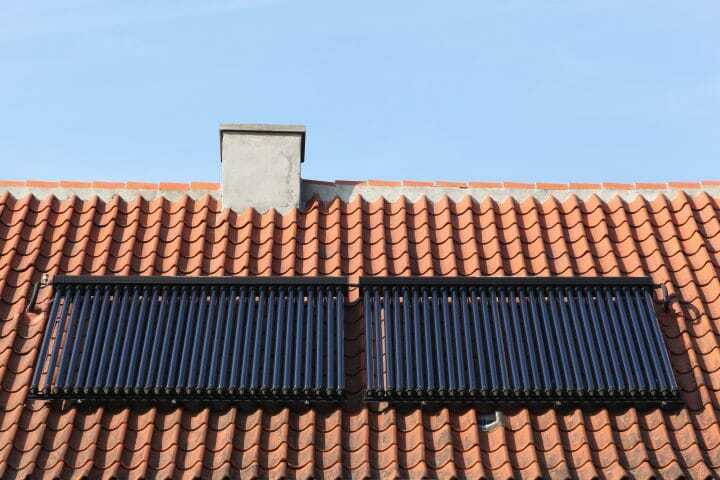 This is done with a different type of solar panel that we often refer to as a solar thermal collector. Solar thermal collectors heat a liquid which is then passed through a heat exchanger. This, in turn, helps to heat a domestic hot water supply, reducing energy costs. Home solar thermal systems like this one can help to reduce your heating bills. This type of solar energy system is less common that solar PV – the technology we use to generate power. It is however growing in popularity in many parts of the world. Solar thermal energy can also be used to heat air – another technology that’s seeing an increase in popularity. But Aren’t Home Solar Installations Expensive? To put it bluntly, yes they are. However, you should take into account how much you will be able to reduce your average monthly electric bill by. Whilst installation costs are high, solar panels will help to reduce your electricity costs. As a rough guide, it can take around 20 years for a solar installation to pay for itself. You might be able to expedite this process if you can benefit from a federal tax credit. Such schemes may be available to help finance or reduce the costs of home solar energy systems. You should check with the appropriate agency for further information on this. Always consult a reputable installer. They should have full information on any tax credits available to you and be able to advise on the ROI of your system. Sometimes saving money involves spending money, but it’s important to get the balance right in order to achieve ROI in the long term. So there we have the answer to how you can use solar panels to reduce your energy bills. You can use them to generate a source of cheap electricity, helping to reduce your annual electric bills. Alternatively, you can make use of solar thermal technologies to heat your domestic hot water supply and save money on your heating bills. Whilst the initial cost of solar energy systems can be quite expensive, the investment can more than pay for itself over the lifetime of your system. Remember to look into federal tax credits to see if they are available and whether you qualify.